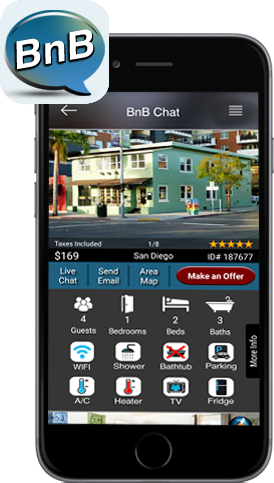 This is a legal Agreement between you and BnB Chat, Inc., hereinafter referred to as (the “Company”, “BnB Chat”, “we”, “us”, or “our”) regarding the treatment of information collected through use of our software, services, applications, or website (the “BnB Chat Software”) including any improvements, modifications, enhancements, fixes, updates, and future versions thereto (“Updates”) and whether made available for free or a fee, (collectively, the “Software”). When you create a new account, you are required to provide us with a unique password and email address. We collect information you provide to us when you request services or information from us, register with us, respond to customer surveys, or otherwise interact with us. We use your information to (i) provide you with the services you request, (ii) communicate with you about your account or transactions with us and send you information about features on our applications and sites or changes to our policies, (iii) send you offers and promotions for our services or third-party products and services, (iv) personalize content and experiences on our applications and sites, (v) provide you with advertising, (vi) optimize or improve our services and operations, and (vii) detect, investigate and prevent activities that may violate our policies or be illegal. We provide you the ability to exercise certain controls and choices regarding our collection, use and sharing of your personal information. In accordance with local law, your controls and choices may include (i) you may correct, update and delete your registration account, (ii) you may change your choices for subscriptions, newsletters and alerts (if applicable), (iii) you may choose whether to receive from us offers and promotions for our products and services, or products and services that we think may be of interest to you, (iv) you may choose whether we share your personal information with other companies so they can send you offers and promotions about their products and services, (v) you may choose whether to receive targeted advertising from many ad networks, data exchanges, marketing analytics and other service providers, (vi) you may request access to the personal information we hold about you and that we amend or delete it. Please be aware that, if you do not allow us to collect personal information from you, we may not be able to deliver certain products and services to you, and some of our services may not be able to take account of your interests and preferences. If you have questions regarding the specific personal information about you that we process or retain, please contact us at admin@bnbchat.com. Notice may be sent to you by email at the last known email address you provided us, by posting notice of such changes on our applications and sites, or by other means, consistent with applicable law.